The TiGr mini is something completely different. It doesn’t look like other bike locks. It doesn’t work like other bike locks. It isn’t even made from the same stuff as other bike locks! A complete re-imagination of what a bike lock should be, the TiGr mini comes from a desire to improve weight, storage and usability without sacrificing security. No, this isn’t the lock. It’s the box it comes in! So how well does it meet those aims? Well, there’s no doubt that it’s the lightest bike lock in town. But how easy is it to carry around? How easy is it to use? And most importantly, how secure is it? First things first. Bike locks are usually made from steel. The TiGr mini however, is made from titanium. And different metals have different levels of strength, hardness and toughness that will influence the security of a lock in different ways. The TiGr mini lock, 2 keys and the frame mount. Now we could have a long discussion about these different properties. About how they differ between steel and titanium. And about how they’ll affect the security of your bike lock. But it might get pretty boring. And I might get a bit out of my depth. So I’ll limit it to this. 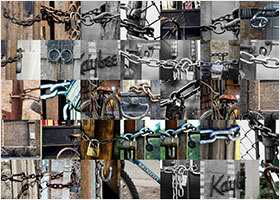 In terms of bike lock security the two metals have different advantages and disadvantages. For example, the hardness of steel is good against cutting attacks, while the flexible strength of titanium is good against leverage attacks. But these advantages and disadvantages will vary according the grade and alloy of the metals used in your lock. So it’s not that one metal is necessarily more secure than the other. It’s more complicated than that! And that’s why, (as always) it’s good to look at what the independent experts say! Organisations such as Sold Secure and ART, test locks by attacking them with a huge variety of tools and then rate them according to how well they resist those attacks. The ART tests tend to be a little more demanding than those of Sold Secure. So 2/5 stars from ART is equivalent to at least a Silver rating from Sold Secure. (There are some 2/5 ART locks that have a Gold award form Sold Secure). I know that the manufacturers plan to have the TiGR tested by Sold Secure. And while I doubt it offers Gold level security, I’m sure it will be awarded a Silver rating. And this makes it a mid-security lock. If you’re not sure about whether you need a mid-security or a high-security lock, check out my complete guide to finding the best bike lock for you. Now, if you’ve read anything about TiGr locks you may have come across the following video which shows a German girl cutting through a TiGr bow lock incredibly easily with a pair of 24″ bolt cutters. No leverage needed here. She was just using the strength in her arms! However, this was an older version of the TiGr bow which had a width of 0.75″ (19 mm) rather than the newer models which are 1.25″ (32 mm). Now I’m not a huge fan of these videos. Whether they show locks resisting or succumbing to attack, I think they can be misleading and always generate unresolvable arguments. And that’s why the independent testing organisations are so good. They test locks in scientific conditions, using consistent tools and techniques. So if ART give it 2/5 stars then I know how secure it is in comparison to a host of other locks. And for me the bottom line is this: the TiGr mini is a mid-security lock offering Sold Secure Silver levels of protection. It’s not a lock for high value bikes in high risk areas. It’s not a lock to leave with your bike overnight. But for less valuable bikes, less dangerous areas and for shorter stops, it offers more than enough protection. Again, see my full guide for more details on how to work out what level of security you need. This is where the TiGr mini really shines. Being made from titanium, it’s super, super light. And of course this is the whole point of making a titanium bike lock: titanium has an unparalleled weight to strength ratio. In fact, weighing just 0.9 lb (0.4 kg), it’s almost 50% lighter than the Kryptonite Evolution LITE Mini-6 which is the lightest U-lock offering an equivalent level of protection. That’s not much more than 1 can of coke! And since it’s also pretty compact, measuring just 10.5 x 4″ (27 x 10 cm), it’s easy to carry the TiGr mini around in your bag. You’ll probably barely notice it. However, many people, (me included) either don’t have a bag or don’t want to put a wet, dirty lock in their bag! This is where a frame mount comes in handy. And the TiGr mini comes with it’s own plastic frame bracket that screws into the holes in your frame that are meant for a bottle cage. This mount is really easy to fit. And because the TiGr mini is so light and most of the weight is concentrated in the locking cylinder which is cradled close to the frame, the lock doesn’t swing about and work loose like U-locks often do. It clips in. It clips out. And while it’s in, two rubber bumpers keep it completely static and stable. Again, you’ll barely notice it’s there. Of course not everyone has the holes for a bottle cage in their bike frame. I don’t have them in my daily beater bike. And some people won’t want to give up their water cages for a bike lock. It’s even possible than the mount won’t fit some bikes or that the mount interferes with other items attached to the frame. In this case, TiGr is compatible with the SKS Bottle Adapter, which can be attached to almost any part of your bike and adjusted to an angle the suits you. The original frame mount is then attached to this adapter. Now I haven’t used the adapter myself, but the TiGr is so light that I can’t see there being any issues. So whatever bike you have and whichever way you prefer to transport your bike lock, there should be method that suits you and makes it really easy to carry the TiGr mini around on a daily basis. The lock consists of two parts: a titanium bow and a steel locking cylinder. The bow is a solid strip of titanium 0.125″ (3.2 mm) thick and 1.25″ (32 mm) wide. And the strip is fashioned into a triangle shape with an open gap in one corner. The gap is about 2.8″ (7 cm) wide. And it’s through that space that you need to fit your frame, your wheel and whatever you’re locking your bike to. Now that’s a pretty small gap. But because titanium is so flexible, you can pull the ends apart to double the space if you need to. Once you’ve got everything through the gap there’s a bit more room within the triangle, which is 7″ (18 cm) long and 4″ (10 cm) wide. This should provide enough space for most bikes while still being a tight fit (which is important for security). The flexibility of titanium then allows you to pinch the two ends of the bow together and attach the locking cylinder, which is secured around the anchors at the end of the bow by pushing down a button type inner cylinder. In order to remove the bow you need to pinch the two ends together so that they’re no longer anchored to this rim and can be pulled from the cylinder. When you push down the button to lock it, you’re actually pushing a metal bar between the two ends that prevents you pinching them together. This very neatly takes advantage of the natural “springiness” of titanium as part of the locking mechanism. Very simple. And very effective. The locking mechanism may take a little getting used to. You need to rotate the key a ¾ turn to unlock and then all the way back before you can remove it. And sometimes the anchors get caught on the internal rim despite being pinched tightly together. But I quickly got the hang of it (the trick is to “tilt” the cylinder on and off) and found locking and unlocking very easy, with the push button locking system particularly satisfying. Speaking of keys, you get two, chunky metal keys with the TiGr mini. And a dog tag with a registration number that allows you to order extra keys online at a cost of $10 per pair. And these are pretty sturdy keys so I can’t imagine them snapping off in the lock. You can order multiple locks keyed alike. And you can even order extra cylinders should you need them. (I would’ve thought it would make more sense to be able to order extra bows in case they were damaged during attacks, but at the moment that doesn’t seem possible). Actually using the TiGr on your bike is pretty straightforward. The bow is covered in a transparent plastic film that should protect your paintwork. And it’s just a matter of getting the lock around everything you want to lock up. The titanium allows you to stretch the gap a bit as you position the lock. Then the bow just springs back into it’s original shape when you let go. It can be a tight fit. And if you want to lock your wheel and your frame at the same time, you might find it frustrating with big chunky wheels and a thick frame. So for me, the TiGr mini seems best suited to road and town bikes. I’m able to get it round the front wheel and frame or the back wheel and frame on my hybrid bike. But sometimes it’s a little bit tricky to get it in a position that works. TiGr mini using the “Sheldon” method. Just make sure you understand the inherent risks of each method when you’re considering which way works best for you. The TiGr mini is something completely new. It’s totally different to any other bike lock I’ve used. So it comes with a whole new set of advantages and disadvantages. The best thing about the TiGr mini is it’s weight. 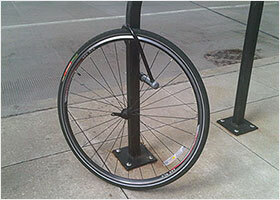 It’s much lighter than any other bike lock that offers comparable levels of security. And since it’s so compact as well, it’s incredibly easy to carry around on a day to day basis. Whether in your bag or on the custom mount, you’ll barely notice it’s there. It’s easy to use. In fact, it’s generally a pleasure to use, with a high quality finish, an efficient frame mount and a satisfying locking mechanism. It’s also the only bike lock I’ve ever seen that I’d describe as aesthetically pleasing! This won’t matter to everyone but it’s sculptural qualities won’t spoil the lines of your bike like other locks do. TiGr is a small family business based in the US. They clearly care about their product and their customers. And this means if you have a problem they will respond and they’ll do their best to resolve that problem. It is small, which limits the places and the ways you can lock your bike. In fact you’re pretty much limited to towns and cities with plenty of bike racks. It won’t fit around lampposts and parking meters. But that’s only the same as most mini U-locks. It’s not a high security lock. 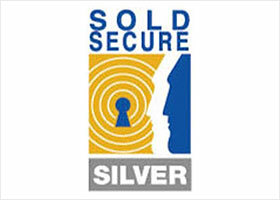 It provides Sold Secure Silver levels of protection which makes it ideal for medium risk situations. I wouldn’t leave an expensive bike in a high risk area for an extended period of time, secured only with a TiGr mini. 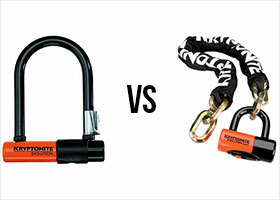 Since it’s strengths and weaknesses are different to a U-lock it should take different tools to beat them both. And since you’d always want a secondary lock to be lightweight and easy to carry, the TiGr mini is ideal. The TiGr mini isn’t trying to be the most secure lock in the world. The Fahgettaboudit is already doing a pretty good job of that. The TiGr is trying to be the lightest lock in the world. And since it’s nearest rival is almost twice as heavy, you’ve got to say it’s also doing a pretty good job. Now of course you’re going to pay more for that weight saving. And many people won’t think it’s worth it. Just as many people don’t think the weight sacrifices of the Fahgettaboudit are worth it. And that’s fine. You’ve got to find the balance of price, practicality and security that works for you. Then you should definitely take a look at the TiGr mini. Although the Abus GRANIT Plus 640 150 has been awarded the same Sold Secure Silver rating I’d expect the TiGr to be given, I’d argue that the Abus lock is the more secure of the two. German made Abus locks have great strength to weight ratios, so the 12 mm shackle should be pretty resistant to cutting attacks. And the double bolted mechanism will protect if from many leverage attacks. Of course the Abus lock is also significantly heavier. It’s a mini U-lock so it is pretty small and light. But it still weighs 1.90 lb (0.86 kg), which is more than twice the TiGr mini. It has got slightly more internal space but, it’s a different shape and isn’t flexible so it’s difficult to say whether it would give you more locking opportunities. But it’s around the same price as the TiGr mini, so if you’re looking for something that’s small, light and little bit more secure than the titanium lock, then this could be a good choice. The TiGr mini is expensive. There’s no getting away from that. So if you’re looking for a similar size lock, that offers a similar level of protection for a much cheaper price, then it’s hard to go wrong with the OnGuard Bulldog Mini. It’s not rated by either Sold Secure or ART, but since it’s just the smaller version of the standard sized OnGuard Bulldog DT which is rated Sold Secure Silver, I think it’s safe to assume the mini offers the same level of protection. This is a no frills lock. It’s not double bolted. It’s got a 13 mm shackle. And the weatherproofing’s not great. But it’s usually less than a third of the price of the TiGr lock. At around 2.15 lb (0.98 kg) it’s obviously much heavier than the titanium lock and it will be more difficult to carry around. But if price is paramount then the OnGuard lock is a great choice. The TiGr mini is a pretty small lock. And this means it doesn’t give you a whole load of options when you’re looking for somewhere to secure your bike. So if you need something bigger, take a look at the LITELOK. Like the TiGr, the LITELOK is a completely new concept in bicycle security. It’s made from a special material they call “Boaflexicore”, which is both incredibly tough and incredibly light. Which means the lock can be a pretty long 29″ (73.6 cm) without being too heavy. Weighing 2.45 lb (1.115 kg), it is much heavier than the TiGr but it’s much lighter than a chain. And you’ll be able to use it just like a cable or chain lock. You’ll have far more locking options when you’re looking for places to lock your bike. Lampposts, traffic lights parking meters, wide railings. A whole load of places inaccessible to the TiGr mini will suddenly become available! I haven’t used the LITELOK myself yet. But there a few reviews from people who have in the comments beneath my preview. It’s about the same price as the TiGr mini and is rated Sold Secure Gold! It’s much bulkier however and will certainly be more difficult to carry around. But it’s definitely worth considering if you want a high security, lightweight lock that gives you loads of places to lock your bike! I purchased the original bow lock and it’s been great, light, easy to carry and use. I intend to ALSO purchase the mini because my view is that I can have 2 locks for less than the weight cost of a single D lock and that surely has to be more secure if there’s 2 locks to get through. I will get one of these, I live in Perth, Western Australia, cannot say I have seen too many shady characters running around with angle grinders, hack saws and bolt cutters. Not to say we don’t have any. I think this lock offers a sensible level of protection while you grab your coffee at the local for 10 minutes. With the weekend bike culture in Perth, there are many like minded individuals also getting their coffee and sitting outside the coffee shop with their pride and joy. Really like the weight spec and how it attaches to the bike. If I was to leave my bike all day unattended, well it would probably only be a cheapie bike so if it did get stolen, well, so be it. You have to be kidding me by paying attention to that nonsense publicity of “elegant lock” and “family owned business”. Look at the video of the girl not even using leverage on the bolt cutters to go through the lock. Even if the newer version is wider it might very well just take one additional cut to brake it. I guess the company did not have enough family members to conduct proper stress test on the product during research & development. But hey! you will look super elegant and cool with that lock although you may no longer have the bike! I think the point is that the wider version can’t be cut at all as the mouth of bolt cropper can’t be closed around it. Just back from Interbike 2018. Ran across a mini lock lighter than the TiGr! Totally stealth, just happened to pick it up and go wow. Aluminum construction makes it light. So easily broken or cut no doubt, but same visual deterrence as any other mini lock (probably 95% of the game). The aluminum construction is not visible through the cladding. Not worth the risk in my opinion David. As soon as someone has a go at this, you’ll be saying goodbye to your bike. BosnianBill on Youtube recently showed how easy the “upgraded” is to defeat by cutting and that there is a weakness in the lock that leaves it vulnerable to a slidehammer attack. The latter was a bit labored, but the cutting was easy.